Don’t like glutinous rice balls? How about cooking and eating just the sweet peanut soup on its own as after-meal dessert, then?! Many thought that peanut is fattening, but you didn’t know that peanut is a good source of monosaturated fats which benefits our health emphasizing on reduction in risk of getting cardiovascular diseases. So, eating peanuts in small quantity regularly or just having it moderately once in a while is good. It may even help in weight management in long run because by eating nuts as snacks, it prevents you from stuffing unhealthy junk food and even helps to curb your appetite for not overeating in actual meals. So, don’t condemn peanuts, ok? 1) Rinse and soak peanut in room temperature alkalined water for at least 2 hours. 2) Drain and replace with clean water, continue to soak for another 20 minutes. Repeat step for 1 – 2 more times to wash off ant trace of alkaline residue in the peanuts, if necessary. 3) Bring a pot of water to a boil over high fire. Add in peanuts. Cover pot with lid titled, and bring it to a boil again. 4) Lower heat to low fire to simmer for at least 2 hours, or till peanuts are cooked and softened. Add soy milk and dissolve sugar. 5) Increase heat to medium fire to bring the pot to a slow boil. Add in glutinous rice balls and gently stir the rice balls immediately to avoid sticking. Reduce heat to low fire now and let rice balls cook in the peanut soup till all rice balls float up. Heat off and serve hot. A portion of my glutinous rice balls with mashed peanut filling (3 balls) in sweet peanut soup counts about 400kcal. 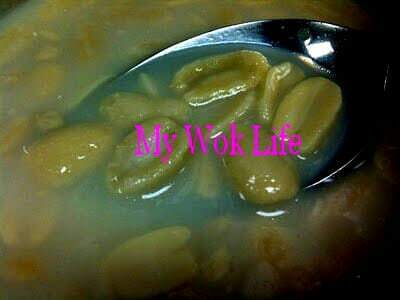 For more options: You may cook the peanut soup with just the plain water or entirely with soy milk, but use low fire for such long simmering to avoid burning of soy milk. Tips: To shorten cooking time, use pressure cooker to cook the peanut soup (about 45 min to an hour). * Alkaline solution in bottle is available in baking supplies shops or supermarkets (baking items cell). If not, use baking soda. Or, you prefer overnight soaking instead, but it may not be melting soft unless long simmering time takes place. Hi! I LOVE peanut soup but unfortunately can’t get the can ones here in the US. So soaking the peanuts in baking soda will work the same as alkaline water? If yes, how much baking soda to water? Thanks! Please try using a tablespoon of baking soda into spacing water to steep at least a few hours to overnight. It is likely to work well. Let me know the result! Perhaps your Mr has a stronger palate than you. It’s nothing to do your cooking skill, then. Just need to find out the best suitable taste for both instead. 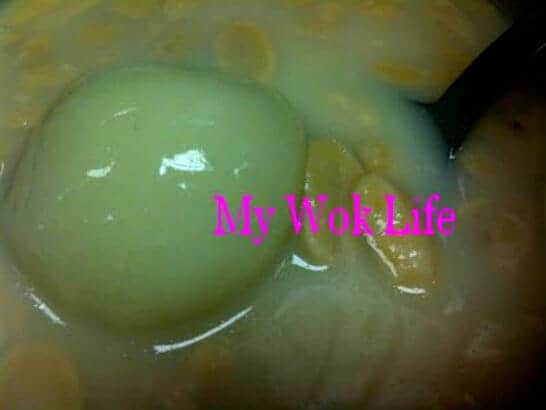 Thanks for sharing this nice recipe…btw how do you make the alkaline solution (jian shui)? Can buy off the shelf? Can enlighten the purpose of pre-soaking the peanuts in alkaline soln? PS: Just a suggestion, the bright blue font dont seems to go too well with the pink background…cos need to highlight then can see clearly, maybe can use another darker color as contrast? Alkaline water in bottle can be purchased IFC the shelves easily. Go NTUC Faieprice (baking cell) or specialized store like Phoon Huat baking supplies shop to check it out. Alkaline water to help soften the peanuts easier. PS: Understand that, but it is done on purpose. :) Turquoise colour is one of my lucky colours which I like it to be my header on each post. hmm i am currently in aussie, i dun think they sell alkaline solution here… and soda powder too… any suggestion?? Baking soda shd be available in Australia. It is often used in baking. Anyway, if you can’t get any, try soaking the peanuts with just plain warm water.